This book is not for everyone. If you get a kick out of evocative historical fiction, if you don't mind a little magic and fantasy, and most importantly, if you have the stamina to wade through a thousand pages, then step right up! For those of us who like sinking luxuriously into distant time periods and exotic locales far different from our daily lives, Jonathan Strange & Mr Norrell is a great escape. It's the (very long) story of two rival magicians in early 19th century England. If you think about it really hard, I bet you can guess their names. The titular pair have an embattled relationship over the years, but their chosen profession inextricably links them. Their paths continually cross, with varying results, as they pursue their ultimate goal of restoring magic to England. In Clarke's alternate world, magic used to be practiced as commonly as any of the other trades, but it slowly leached out of the culture until only theoretical magicians remained. Norrell and Strange are unique in that they are actually able to practice magic, though Clarke keeps the inner workings of their methods fairly obscured. The novel is clearly well-researched*, and the mashup of history and fantasy is seamless and compelling. There's a respectable level of suspense, especially in the second half, when we're anxious for a few particularly unsavory characters to meet their just deserts. However, be warned that the pace is slow. Not tortoise slow. Not snail slow. I'm talking sloth slow. I'm talking standing in a zoo, staring up into a tree, wondering if it's still alive, oh wait I think I just saw it breathe, maybe in a couple hours it'll manage to eat an entire leaf slow. 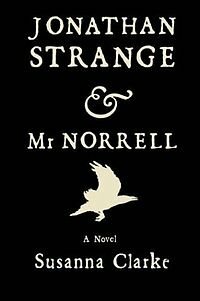 If most books are like fleeting daytrips or weekend getaways, Jonathan Strange & Mr Norrell is like the long-haul trucker version, Newark to Seattle with no scheduled stops. As long as you're expecting that kind of trip going in, you'll be fine. Get yourself a big cup of tea, maybe a muffin and a cozy blanket, and settle in. *A note: The actual text of the novel is roughly 850 pages. What brings the total up near 1000 are the copious footnotes Clarke includes throughout. I read this book on Kindle and found it too cumbersome to switch constantly from the footnote section to the main text and back again, so (keepin' it real here) I didn't read them. You may find the extra information enhances your enjoyment, or it may irritate you terribly. I can say I don't feel I missed anything in skipping them. The book was plenty long enough for me already. Newer:The Bone Clocks by David MitchellOlder:Viva Colorado!